Moisturising my skin is something I can’t skip, no matter what! I have quite dry skin and if I don’t moisturise I can feel it. To get the levels of hydration’s my skin has needed, it’s been hard and involved lots of trails of new moisturisers and them just not working. But to this this, I can’t break the bank. 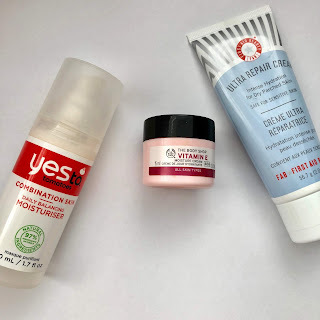 I can’t afford the high end moisturisers, so I’ve spend a fair bit of time researching some of the best drugstore moisturisers! On my hunt, I’ve found afew that have been working well for me. To start with, is my everyday moisturiser for the past 3 years! I’ve been using this for such a long time, I’m on my 3rd tube of it. I purely got it bc Gabriella (velvetgh0st) recommended it and since she was my favourite YouTuber, I knew I had to try it if she liked it. And surprisingly it worked perfectly for me. It’s 97% natural which is a massive bonus knowing you’re putting good ingredients into your skin, it helped balance my skin out like says and it kept me always moisturised. Next is another I’ve had for awhile too, I got it in my 2016 advent calendar (I should probably Throw it out oops!) it’s the body shop vitamin E moisture cream.You only need a small amount, this 15ml tub has lasted me so so long when I’ve used it. When I’ve used it I’ve loved how it has sorbet almost texture which is really light on the skin yet so hydrating and perfect for the summer. Onto the last one, it’s the newest one I’ve received. I got the at the start of the month in a ASOS box and I’ve been using on and off since. It’s the First Aid Beauty Ultra Repair Cream. This is a thick and really hydrating yet light moisturiser. Im really surprised how hydrated it keeps my skin throughout the day with its really light texture and it’s slowly becoming my everyday moisturiser! Who says you need to break the bank to find good skincare? You can’t find some gems in the drugstore if you look and choose what works with your skin. I love trying new skincare but I know I’ll always have my favourites. These moisturisers look so good Bailey. I’m gonna have to try the body shop one. I've heard loads of positive reviews about the yes to tomatoes moisturiser, I really want to try it as I also have combination skin! It’ a holy grail for me!! oh I heard good things about the body shop skin care!